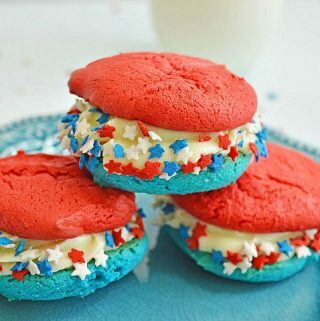 This is a fun cake mix recipe for patriotic cookies. 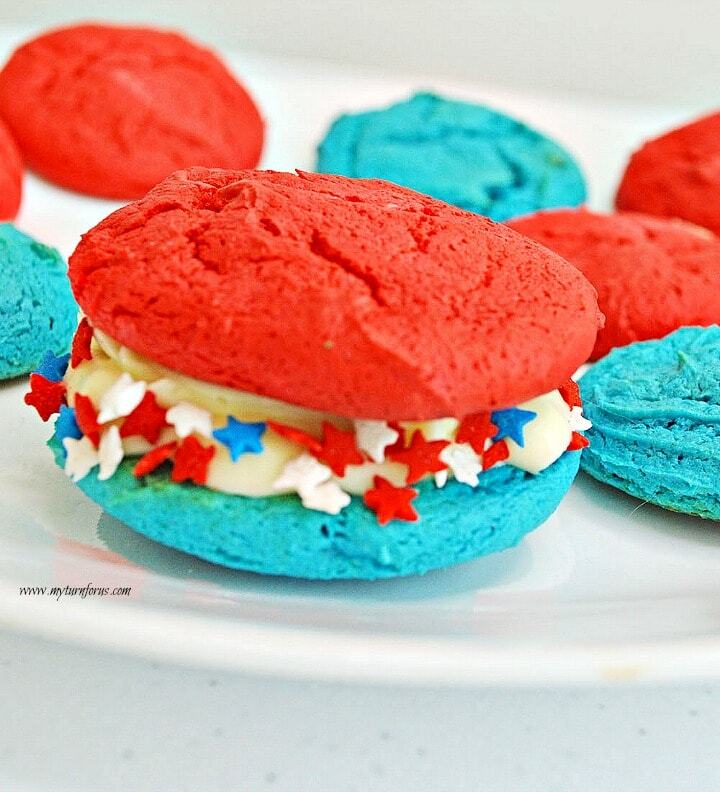 This little red white and blue sandwich cookie is always fun to serve around the Fourth of July. We decorate our house in red, white and blue from Memorial Day until after the Fourth of July. It’s kinda fun since our decorations can cover three back to back holidays, Memorial Day, Flag Day and then “The Fourth”. When I was a teenager in West Texas, we didn’t say the 4th of July we always said, “The Fourth”. Everyone in the county knew exactly which day we were referring to. Small Texas towns like ours always go all out for The Fourth, most towns have a parade with flags flying and ours was no exception. We had a strong sense of Patriotism and our nation’s colors were flown proudly during the week of The Fourth. 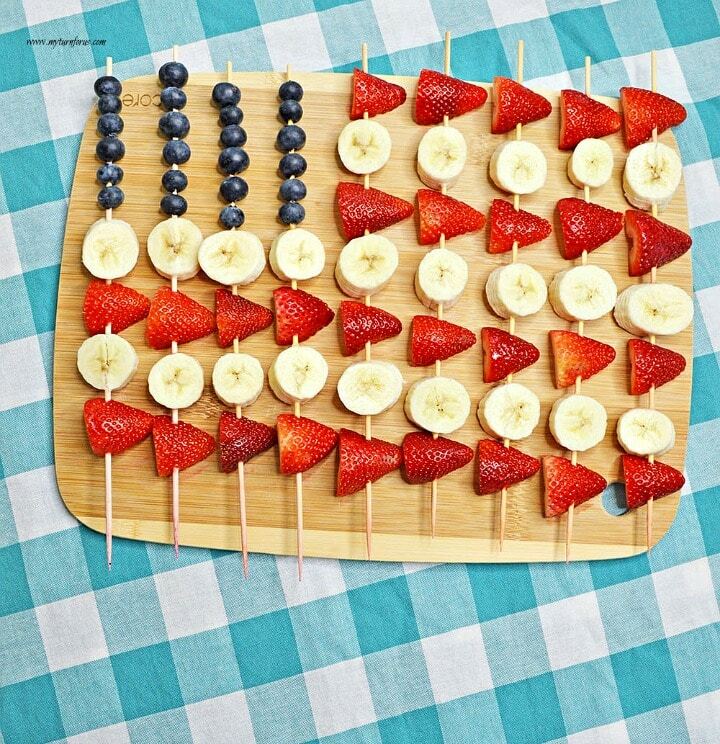 We always enjoyed fun red, white and blue everything. And most of the town’s ladies were very creative with recipes and it always made the holiday more fun. I always enjoyed the little extra touches that made everything more festive. We always looked forward to the Fourth. 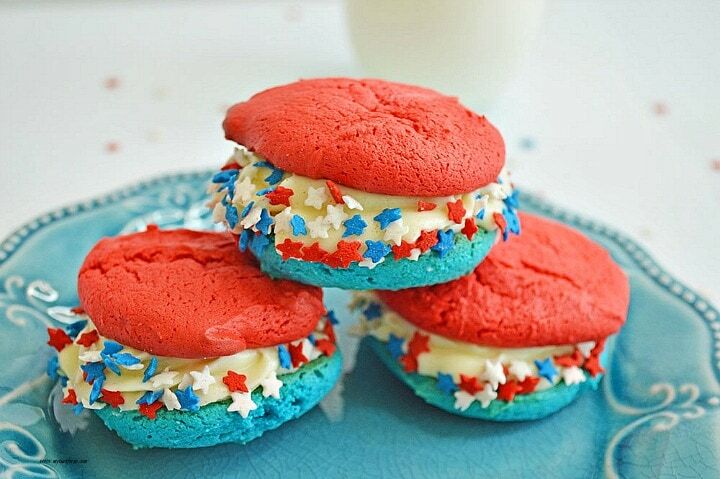 We are staying with the theme of the Fourth and making these little Patriotic Cookies. They are easily made from a cake box mix and food coloring and they look so impressive. By adding a few star sprinkles, these little cookies will delight any youngster. 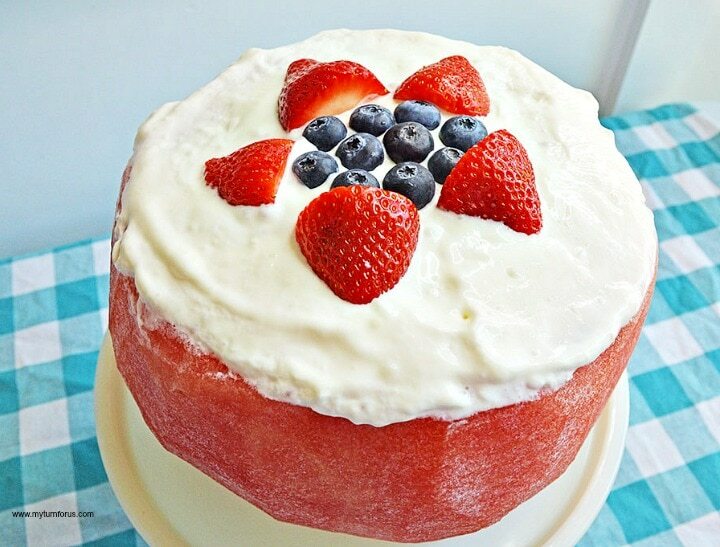 But you don’t have to be a kid to enjoy these red, white and blue treats. 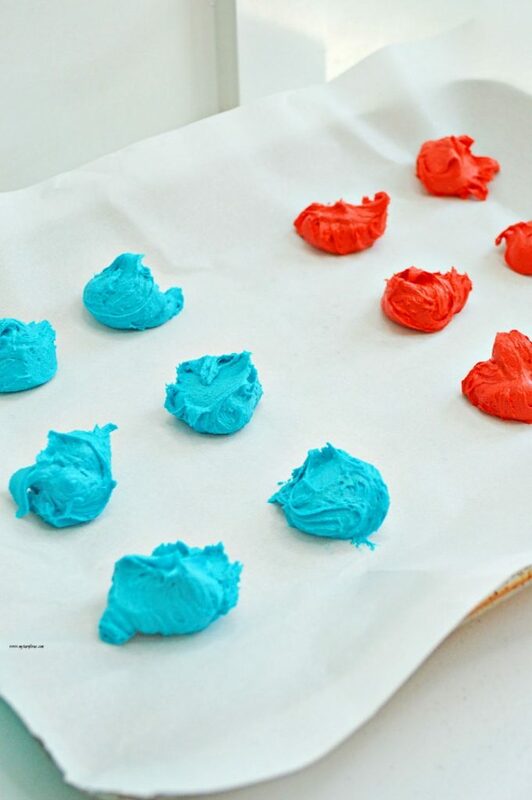 We started these fun patriotic cookies by mixing 1 box of white cake mix with 1/2 cup of butter and two eggs. Divide the dough by half and place each half in a separate bowl. 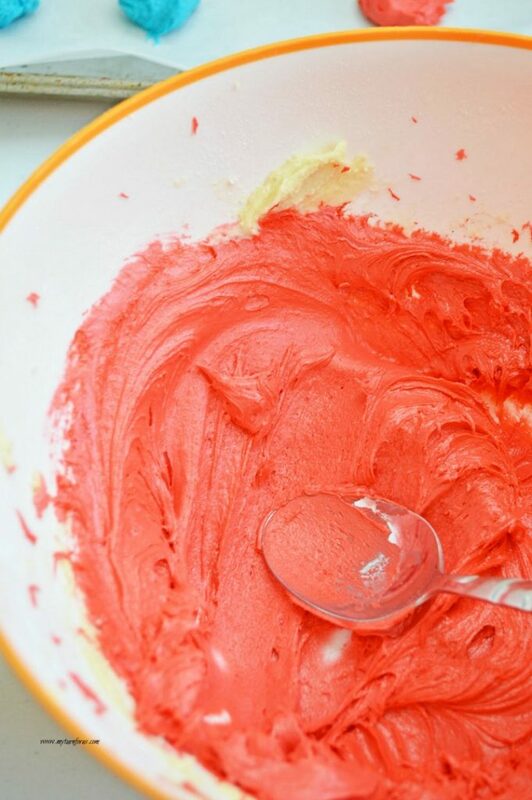 Add red gel food coloring to one bowl of dough and mix, keep adding the food coloring until you get the desired red. Repeat with blue gel food coloring with the other half of dough. Drop the cookie dough by spoonfuls onto parchment lined baking sheets and bake at 375 degrees F for 10-11 minutes. Mix 1/2 cup butter, cream cheese and vanilla until fluffy and mix in powdered sugar. 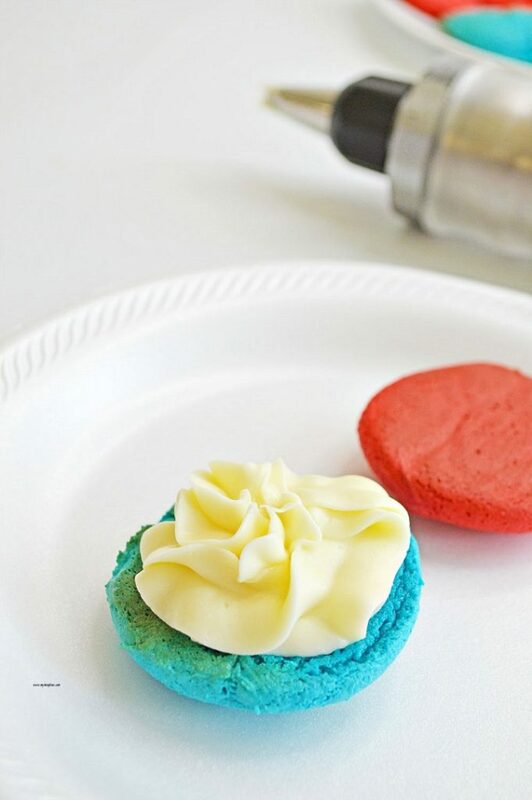 After cookies are cool, pipe frosting onto one cookie, top with the other color of cookie. This inexpensive piping syringe which can be purchased from Amazon is good for this. Hold cookie sideways and rotate to sprinkle with Patriotic star sprinkles. 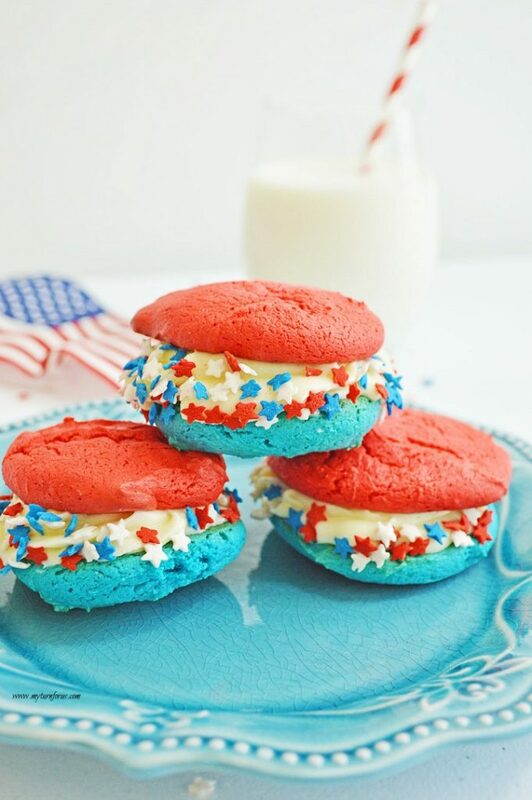 Serve these easy Patriotic Cookies with cold glasses of milk. Or lemonade would be delicious. 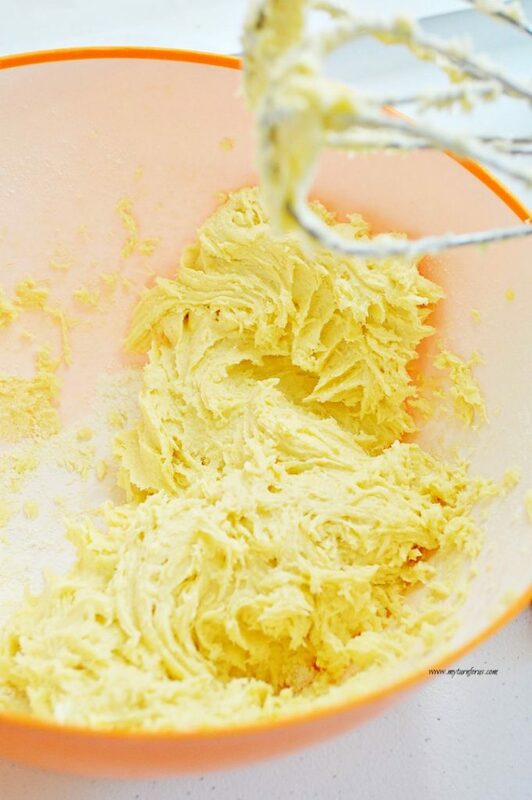 In a large bowl, mix together cake mix, 1/2 cup butter, and 2 eggs. Divide dough evenly between two bowls. Add a few drops of red food coloring to one bowl, mixing well. 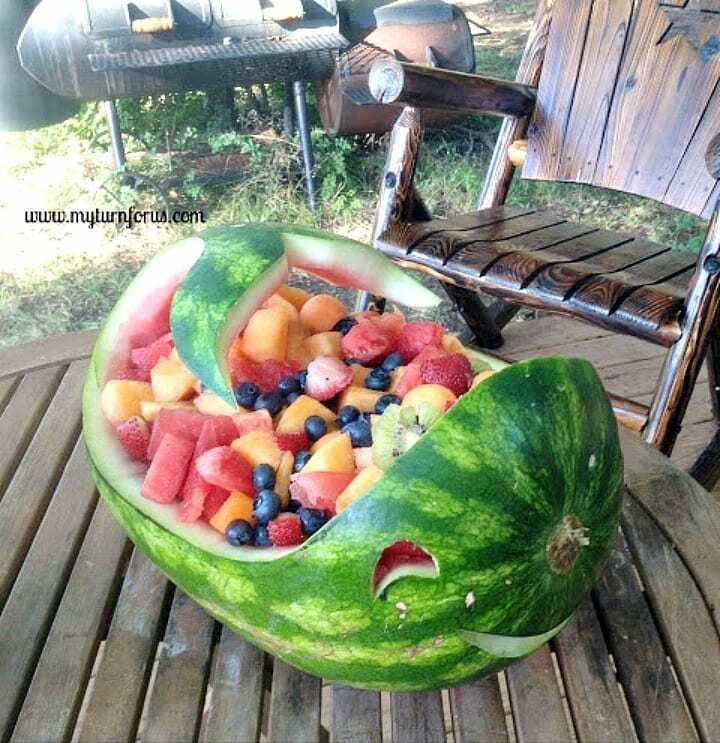 Continue adding food coloring until you get your desired shade of red. Repeat this process for the blue in the other bowl. Drop cookie dough by rounded spoonfuls onto the parchment paper. Meanwhile, in a large bowl, mix 1/2 cup butter, cream cheese, and vanilla until fluffy. Mix in powdered sugar. Once cookies are cooked and cooled, pipe icing onto one cookie and top with another cookie. Be sure to flip the cookies over so you have a flat surface on both sides of the icing. 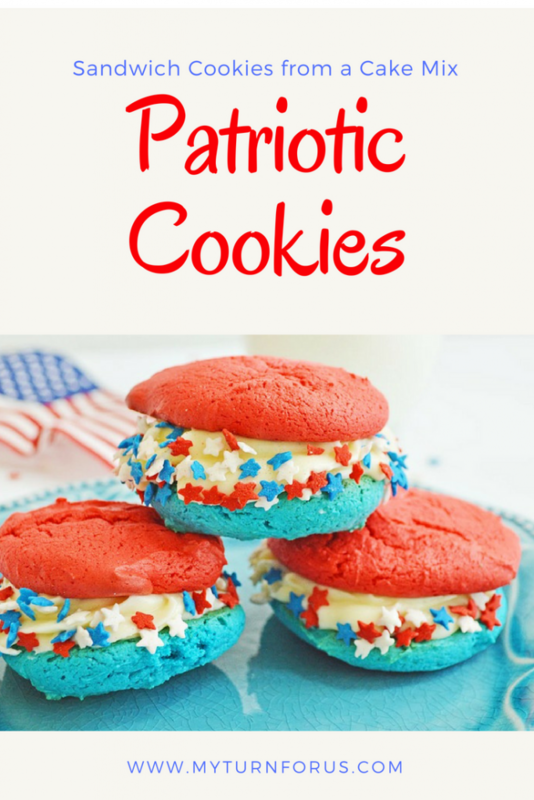 Hold cookies sideways and rotate to sprinkle with fun patriotic sprinkles. Sweet! You have subscribed, check your email for the link!